Ring in 2012 with Red Wine Sangria! It’s hard to believe that 2011 is almost gone. At initial thought, I would have said “GOOD RIDDANCE!” but a lot of momentous things occurred this past year. I moved to a beautiful new city, welcomed my nephew to the world, reconnected with old friends—made new ones, spent more time with my family, and rediscovered my voice. So to you, my Friends—Here’s to 2012 with all of its potential and unexplored Foodventures! ps. 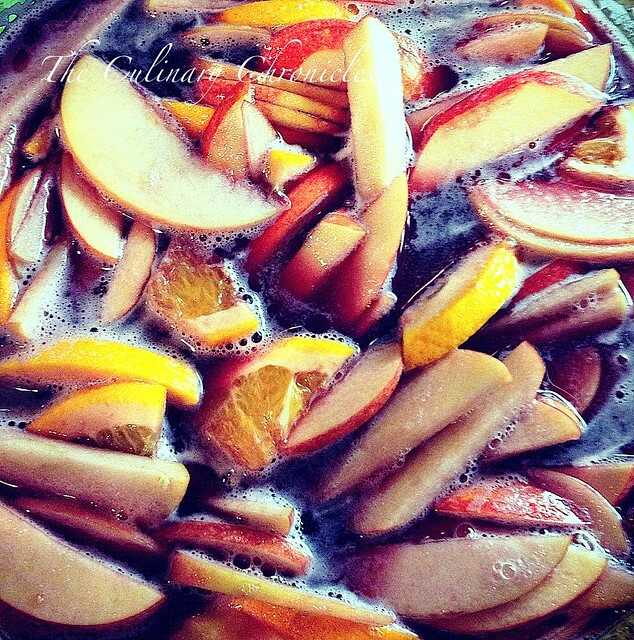 Your loved ones will pretty much adore you after you make this Sangria. True Story. In a large container (that can be tightly sealed), add in all the ingredients and stir well. Securely cover the container and store in a cool place overnight (or at least 8 hours). Before serving, mix the sangria. Serve in tall glasses with ice and the fruit that was soaked in the liquids. Cheers!